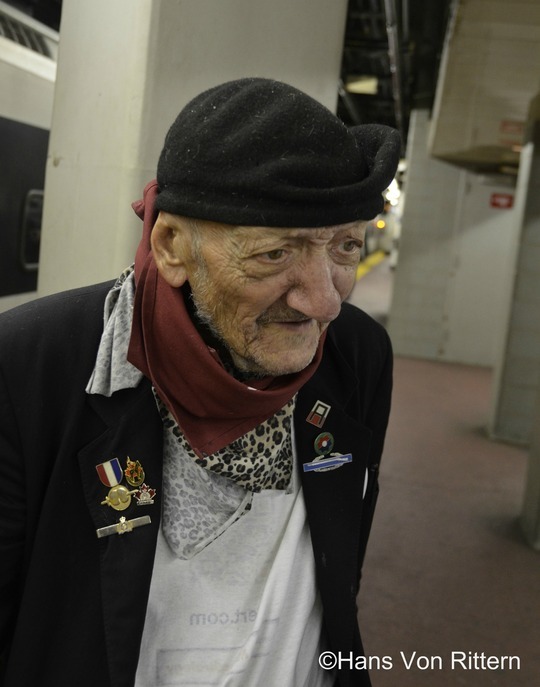 Photo of the day: THE WORLD WAR II VET – In 2012 I spotted this old veteran outside Penn Station. He had the most determined walk and I loved his unique flair, so I followed him with my camera till he eventually got lost inside the cavernous train station. I approached him to ask if he needed help, he kept telling me he wanted to go to Central Ave in South Orange, New Jersey. So we looked for the train together. Everything about him touched my heart. His tattered clothes, the scraps of cloth he had tied as kerchiefs, he hadn’t shaved very evenly, his inside-out t-shirt and his perfectly tilted beret which was absolutely covered in (his favorite) cat hair, but his medals were perfectly polished and cared for. I just fell in love with him. He told me he is a lecturer on wars, esp. WWII in which he served. He was very spry, I believe he was at least 85 years old yet still filled with such gentille determination. We reached the Jersey bound train platform but no personnel in Penn Station knew of the address he wanted to go to, but I luckily found a kindly conductor who promised me he would look after our vet. I finally helped him get on the train and off we went, each our separate ways. . .
Photo of the day: “LET US DIRTY” – 1:10am, Anthony Alonzi fixing his eyeliner after the Cher concert. On the B train, Brooklyn. 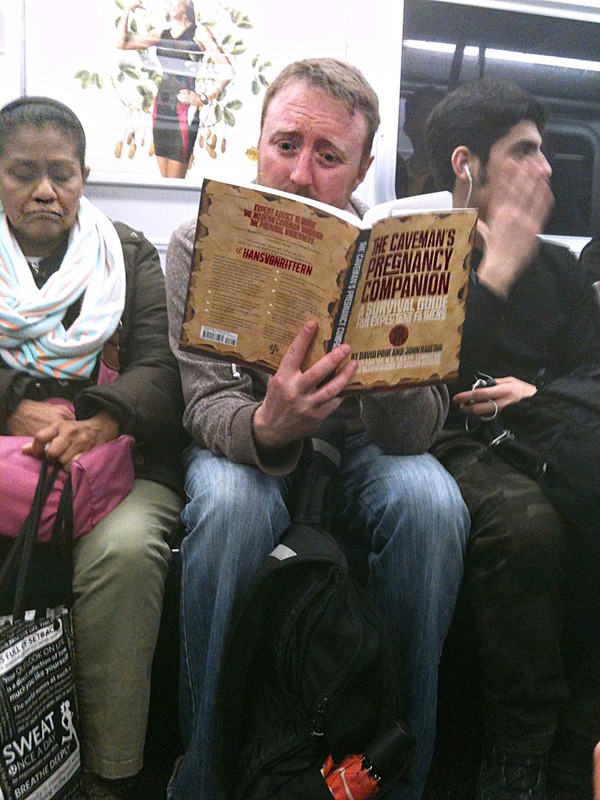 Photo of the day: THE CAVEMAN’S PREGNANCY COMPANION – Uh! Even cavemen need advice when it comes to the big day! I witnessed this priceless scene on the #7 train heading home yesterday. “A three-trimester evolutionary crash course to guide the prehistoric papa-to-be through the prenatal, pre-parental wilderness. Every man should read it! What’s a clueless caveman about to become DAD to do? After all, it’s tough carrying a child for nine months—for him as well as for her. He’s just not sure how to behave. But help is on hand, in the form of a reassuring (and hysterically funny) course for the totally perplexed. Along with a large dose of humor, it provides the father-to-be with all the know-how he needs to become a well-prepared, well-heeled partner who’s really ready to stand upright and embrace his new responsibilities…rather than cowering from them. Every cave-student will find out how to support his mate through this emotional time, cope with his own feelings, deal with baby-related projects, and perform admirably during labor and delivery. So whether it’s catering to his exhausted companion’s needs by preparing a nutritional and tasty meal or engaging in a snuggle session when she craves a little cuddling, with the help of this book a guy will become the proud Cro-Magnon caregiver he longs to be!” Book written by David Port and John Ralston. 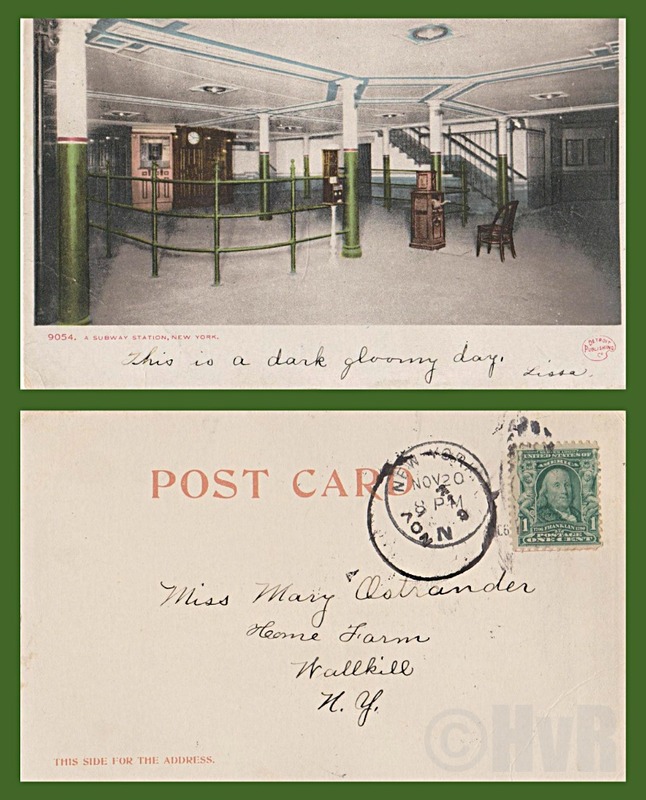 #7 train, Court Street Station, before the station’s renovation. Photo of the day: VANISHING VIEW – As the over zealous, over greedy and over crammed building continues in the neighborhood of Long Island City in Queens, joyful surprise views like this one of the treasured Chrysler building, are rapidly vanishing as the new glass wall of condo towers obliterate the century old Queens view of Manhattan. Next stop, Blandville. 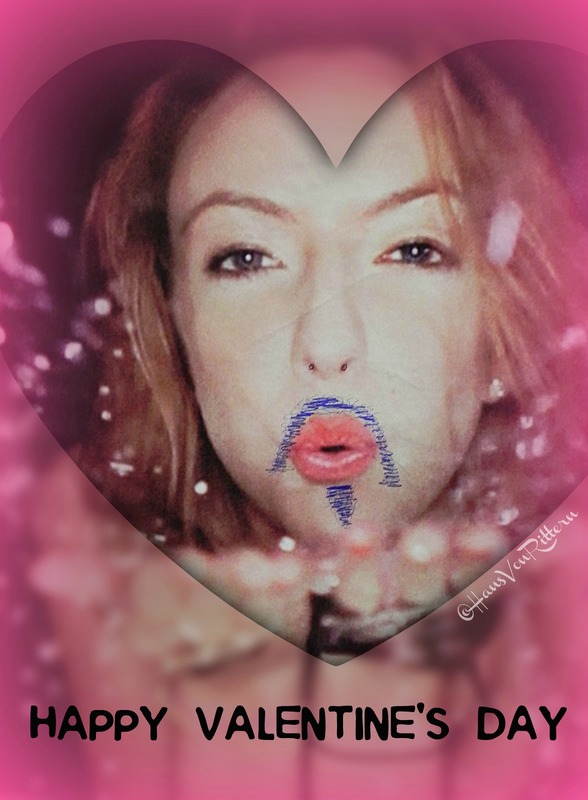 Photo of the day: HAPPY VALENTINE’S DAY ! 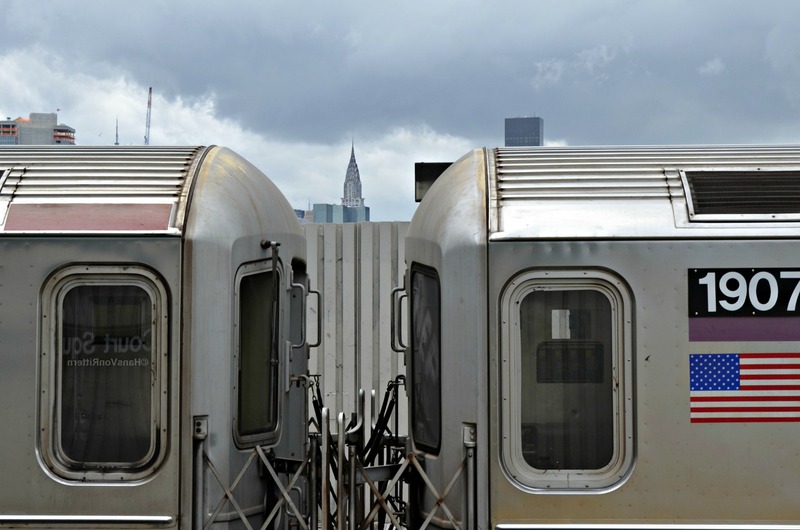 Photo of the day: HAPPY VALENTINE’S DAY from the subways of New York City! 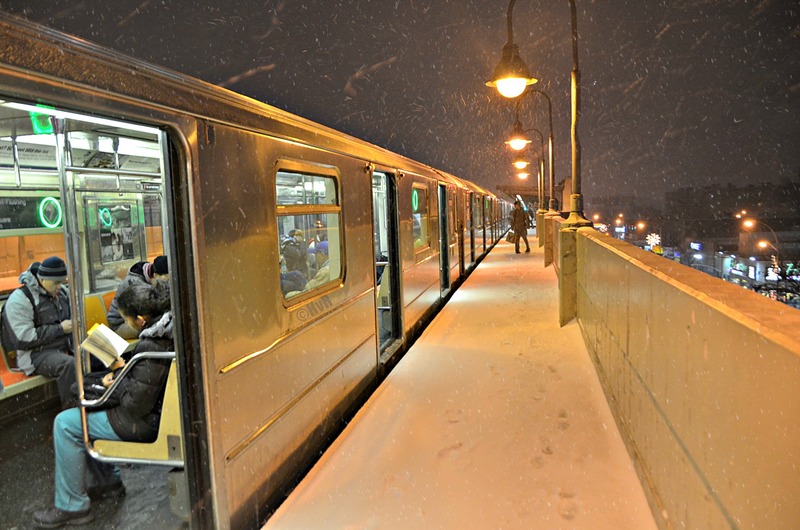 Photo of the day: BABY IT’S COLD OUTSIDE – It is 15°F (-9.5°C) here in New York City and last night winds were howling as we received 10″ inches (.25 meters) of snow for our first blizzard of 2014. 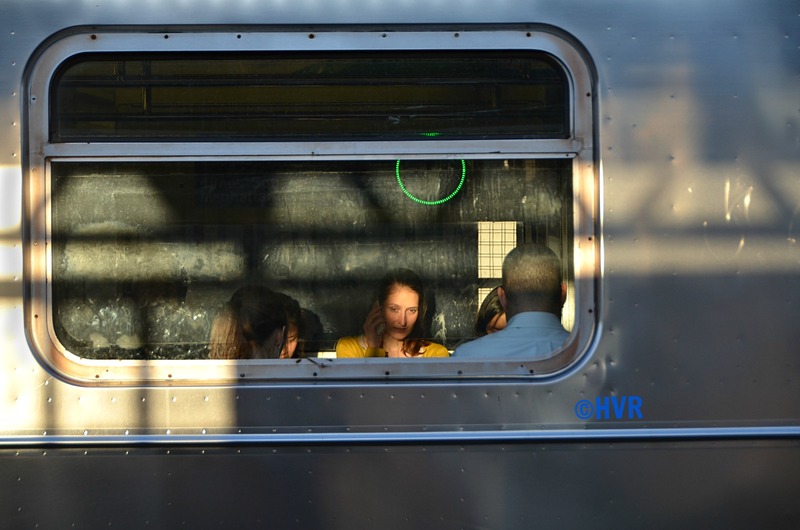 But the commuters aboard the local #7 train at the 46th Street station in Queens were oblivious to the frigid conditions outside as they concentrated on their books and iPhones on their way home. 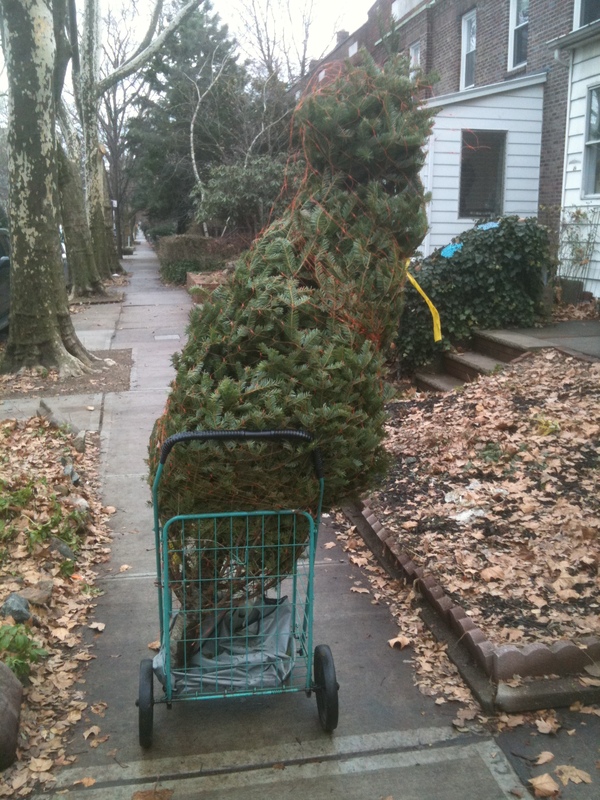 Photo of the day: HOW ARE YOU BRINGING HOME YOUR CHRISTMAS TREE? Photo of the day: HOW ARE YOU BRINGING HOME YOUR CHRISTMAS TREE? – Despite the fact that you see endless traffic in New York City, most New Yorkers don’t have cars nor even know how to drive. (I didn’t learn till my move to Tucson, Arizona at age 38.) The cars you see are from the far reaches of the outer boroughs, from tourists and rentals. So we have to be a little more inventive when we bring home our Christmas trees. 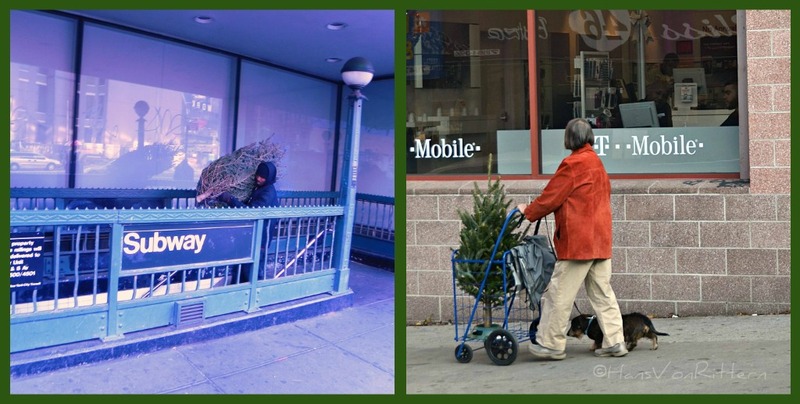 I have seen Christmas trees rolled home on skateboards, pushed in shopping carts, taken on the subway (a 7 footer! ), by sleds in the snow, in taxi cabs and even in baby carriages. So, how are you bringing home your Christmas tree?